A top executive at LG Chem has added to growing optimism over the prospects for commercial and industrial (C&I) energy storage growth in the US. His sentiment echoes views expressed by project developers such as Sharp and Demand Energy, which are seeing growing interest in behind-the-meter systems among large energy users. “Looking at the advantages storage can bring to demand-charge management, we’re very optimistic about how large that C&I segment could grow in the next five years,” Gibson said. 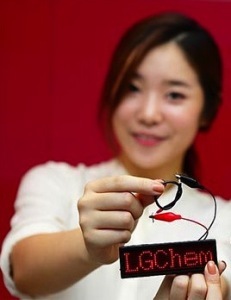 LG Chem last month unveiled a partnership with the worldwide electrical distributor Gexpro, the operating system developer Geli and the power converter maker Ideal Power to target the C&I market. The Gexpro system comes in 30kW, 45kWh units. Additional larger systems will be revealed in time, Gibson confirmed. “A typical installation will use between one and eight 30kW battery energy storage solutions in a commercial building with high peak loads such as retail, office buildings and schools,” said Gexpro in a press release. Demand for such products will “be focused primarily on those states where demand charges are a big component of the energy bill,” Gibson said. According to Gexpro, such charges can account for half of all energy costs in some US locations. Gibson hinted at significant activity relating to C&I in the US over the last 12 months. For now, though, where LG Chem has seen greatest success has been in multi-megawatt, grid-scale projects, particularly within the PJM Interconnection regional transmission organisation catchment area. Two weeks ago LG Chem, along with customer Duke Energy and control systems developer Greensmith, announced a 2MW fast-response battery project designed to improve PJM grid stability in Ohio. “This accurate and rapid response will help improve the overall reliability and economic efficiency of the grid,” said Phil Grigsby, Duke Energy’s vice president of commercial transmission, in a press statement. The project was the second for LG Chem with Greensmith for fast-responding frequency regulation services in the region. “Here in North America, the PJM market for fast-acting frequency regulation has been pretty hot for the past 12 to 18 months,” Gibson noted. “I think it will continue to be really hot for the next 12 to 18 months going forward. Compared to California, where many projects will not get built until the end of the decade, in PJM energy storage facilities are being installed today, Gibson said. LG Chem expects to have four PJM projects online by the end of the year. Besides C&I, and California and PJM for grid-scale projects, LG Chem, which already commands around 40% of the global electric and hybrid vehicle battery market, is also gunning for residential energy storage. In April, LG Chem trumpeted a tie-up with Eguana Technologies of Alberta, Canada, for ‘premium home battery systems’. “The AC Battery is a pre-integrated and fully certified energy storage system which requires only a grid connection and a dispatch signal to provide a fully functional and durable energy storage installation,” said Eguana. 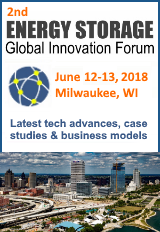 Gibson said he did not expect the US residential energy storage market to equal the C&I or grid-scale segments in terms of revenue potential, “but it still will be significant over the next five or 10 years. As to what Tesla’s announcement means for LG Chem’s pricing in the market, all he would add is: “On both residential and commercial, let me say we are confident that we know what the market price is for each of those areas. 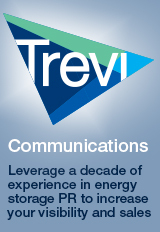 Special reader offer: Find out more about US energy storage market dynamics at Energy Storage USA 2015. Get a USD$250 discount on ticket prices if you register now, quoting ESREPORT250.